Our university town is located in the heart of Germany and has a rich history dating back to Stone Age settlements. Paderborn was the location for historic events such as the publication of the first book against witch hunting in 1630, and the establishment of the oldest Westphalian university in 1614. Paderborn is now a modern city with a young population. High-tech industry and medieval buildings exist here side by side. It is home to a wide range of attractions: from the world’s largest computer museum, to lively cafes and festivals, to parks and forests. 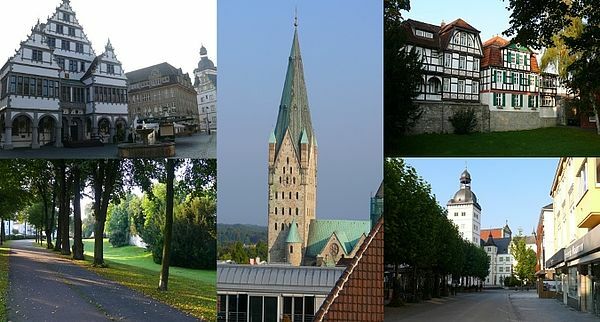 Our city hosts a variety of global businesses that are headquartered in Paderborn and surroundings. Most of these cooperate with university research projects. Paderborn excels in the computer and electronic industries, mechanical engineering, machine tool and structural steel engineering, furniture making, and food processing. A good base to discover Europe: with its own airport and excellent railway connections, it is easy to plan a weekend trip to Berlin, Paris or Amsterdam. A green, clean, and safe environment: you can travel everywhere by bike or bus and do not need to worry about walking home at night. Excellent sports facilities: an offer of every possible sport from archery to yoga at low student rates. An international atmosphere: from Asian supermarkets, to sushi, to international art and music festivals.